Get to know your bread spreads. Feeling hungry? Have an hors d’oeuvre (say or-durv)! That’s the French word for appetizer – the first course of a tasty meal! 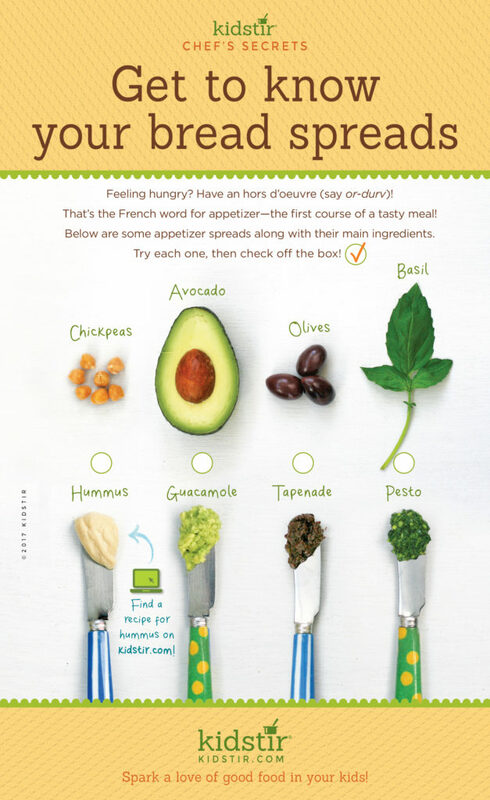 Below are some appetizer spreads along with their main ingredients. Try each one, then check off the box! Find a recipe for hummus on Kidstir.com – with a 10 minute prep time, you’ll be enjoying it quickly. Kids will learn to use these tools: colander, food processor, measuring spoons and cups, knife and cutting board. They will learn the following kids kitchen skills: measuring, slicing veggies, using a food processor, presenting food creatively. 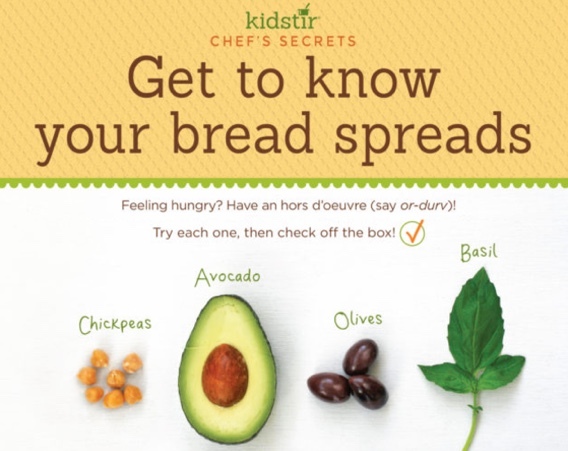 We’d love to offer the Kids Vegetable Bread Spreads Infographic for you to share on your blog. Just select and copy the code snippet below and paste into your next blog post. We’d love for everyone to share this page on social media or email using the buttons below so all the kids you know can learn why bread spreads make great kids foods!